I've been using my new Mastech MS8218 DMM for a while now. I've been quite happy with it. Fantastic value for a $199 meter, no worries at all. Much better investment for me right now than an 87-V or 189. 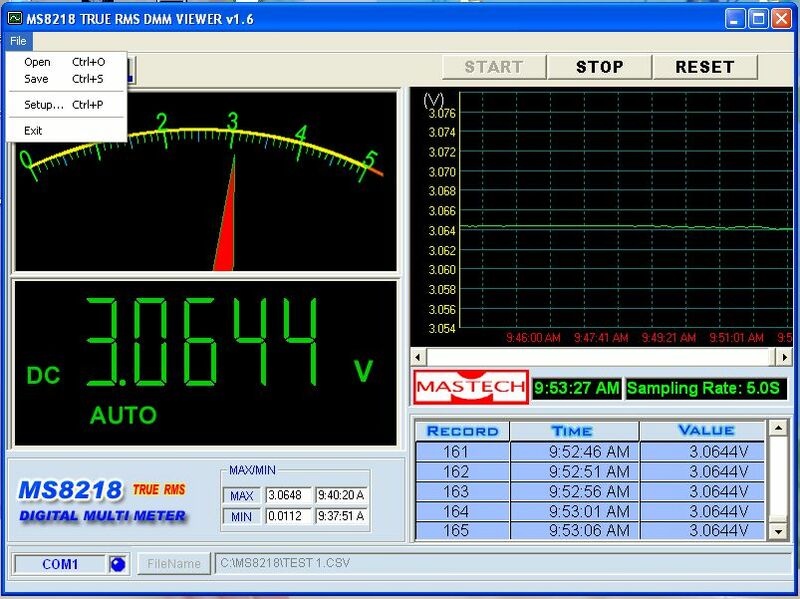 I wanted to use my shiny new toy for datalogging, so I installed the Mastech DMM Viewer on my old laptop. It all installed fine, but the viewer software wouldn't connect to the DMM. The error was a Visual Basic one, "Run-time error 8002: invalid port number". Good old VB. "The issue is related to an inherent port limiting problem with the Windows COM control. It has the nasty habit of only allowing enumeration of 16 COM ports in Visual Basic. If you can't find an unused serial port, you may have to piggyback another serial port. This is generally not a problem as serial ports are often used by devices that aren't frequently plugged in. Cell phones often use them for data transfer so it would be a safe bet that if your cell phone or other similar device isn't plugged in at the same time your programmer is, there won't be a conflict. Bill Cohron - The Mad Doctor "
Now, with the Mastech software, my PC had assigned COM4, which is obviously a valid number, and an extremely common setting to boot. But it still didn't work. COM1 worked, indicating the Mastech software is pretty limited in which COM ports it likes. It may be limited to COM1 and COM2, or just COM1. So try using COM1 before giving up on it. The software is pretty simple, you can see what it does from the screenshots below. Basic, but works just fine, thank you. 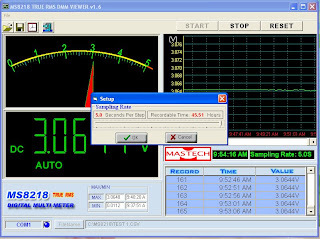 Would be nice to have logging settings that are wider than 1/2 second to 5 seconds, but hey - with 45 hours of total recording time, not too many people will care. Mastech is funny, they sent the software on a CD-R of all things. Guess they didn't want the cost of getting a non-recordable disc pressed! Hi, i'm locking for mastech MS2115B. The software only saves Volts?, Amps? both at same time for watts? No information about it in the official page. 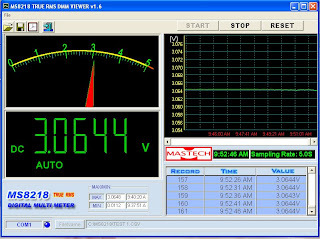 As of now, this article will give you some simple tips to test electronic parts with a multimeter. Along these lines, simply investigate the tips beneath.Right off the bat, you have to test the resistor by turning the multimeter change to the resistor setting Garage tools.